The electric kettle is a gadget which is useful the whole year round. During summers it is used to make tea but during the winter months `its utility increases and it is also used for making hot water for drinking as well as making tea, soups etc. While it is not an indispensible gadget, its utility in the kitchen can hardly be ignored. 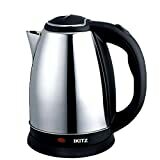 This kettle should be used for water boiling only and not suitable for boiling milk". 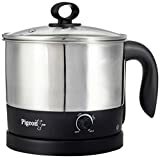 Size and capacity: The size and capacity of the electric kettle to be purchased should be in sync with the hot water requirement of the family as a whole. In fact kettles with a capacity to hold a minimum of 1.4litres of water should always be considered. Kettles of smaller capacity are more suited as travel mates than in the kitchen. 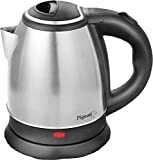 Power: Choosing a kettle with a higher wattage helps to boil the water quickly while those with lower wattage take much longer to perform the same function. Body material: The material making up the body of the electric kettle can vary from being stainless steel, plastic or even glass. But the body needs to have a cool touch casing so that no one gets hurt when a high temperature is attained while boiling the water. The heated water tastes much better. Scale filters: Some electric kettles are especially made for hard water and come equipped with removable scale filters which keep the water tasking crisp and clean. Wide spout: The presence of a wider spout makes it easy to fill up the kettle with water by eliminating the need to open the lid. But care should be taken to ensure that the spout is drip-free so as to avoid extra cleaning hassles. Corded or cordless: Cordless models are always much more in demand since they are portable and can be carried from one place to another quite easily. The cordless models come with a base station which remains plugged to the electrical outlet and the kettle can just be lifted up from it or put back on it for heating. There are a lot of advantages associated with the use of the electric kettle. It is also not only safe; it is also affordably priced within a range of INR300 to INR2000 making this a gadget worth having.